Finding the perfect engagement ring is an important step when it comes to planning a proposal. Fortunately, with a variety of elegant diamond rings at Shimansky, you will most certainly find a ring that suits her style and reflects your love. From a pear shaped diamond cut to the My Girl Shimansky signature diamond cut, there's a diamond ring for every personality. But, is it true that an individual can find a unique diamond with personal facets that only speaks to the person who wears it? Nature is an enigmatic force. It creates and it takes away; with the passage of time, beauty develops. As with everything in nature, there exists a perfect symmetry; the petals of a flower mirror the circular balance of the many facets inherent in a diamond. Each petal slowly unfurls to let in the sunlight; when it is unearthed, each diamond’s light glimmers from beneath its rough exterior, revealed only through the careful work of the most skilled jewellery craftsmen. This is a metaphor that could also be applied to the human spirit. Each person is unique, in character and temperament. Some are gregarious and easy-going, others are refined and reserved. These traits are inherent; they are established by nature from when we are born. Similarly, each diamond holds within its rough exterior an exquisite hidden wonder. As nature determines the art of each of its creations, there is an intrinsic character waiting to be discovered in each stone; this, in turn, attracts a certain personality. “Each person falls in love with a certain diamond – in that is the magic,” says CEO and founder Yair Shimansky. Therefore Shimansky has created a wide variety of exceptional diamond shapes and cuts to suit each and every person’s unique style and personality. 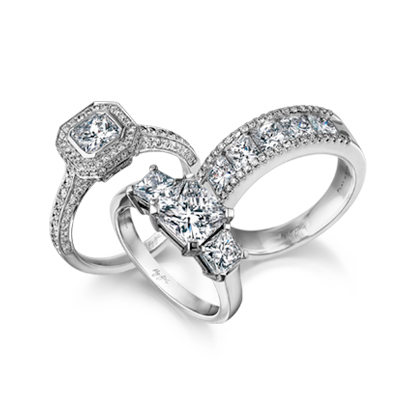 Nature’s perfect proportion is mirrored in the Shimansky Eight Hearts diamond, which exudes a sophisticated simplicity. Due to the acute attention to symmetry and cut, the true hearts and arrows of the diamond is displayed through maximum radiance, attracting the traditionally elegant. Therefore it’s no surprise why the Eight Hearts diamond is considered to be a favourite amongst women worldwide. Pear and marquise shape diamond cuts invoke the nature of an elusive beauty, a reticent but rich personality, set in solitaire. The marquise shape diamond is unique and a popular choice amongst the more outgoing and adventures types. The pear shape diamond is also known as the teardrop shaped diamond; the diamond is popular amongst women who are looking for something different and unique. By contrast, a warm, open person might be drawn to the Brilliant 10’s circular silhouette. The world’s most brilliant diamond, this Shimansky signature 71-facetted stone carries an infinite sparkle that speaks of everlasting confidence and beauty. The breathtakingly gorgeous stone has been used to symbolise trust, commitment and love. Square cuts, such as the princess cut, the radiant cut or the My Girl Shimansky signature diamond cut, the world’s first square-cut diamond with a diamond-shaped table, are classic, destined for a young soul who craves their endearing simplicity. The My Girl diamond ring is known for its unique shape, cut and the ability to captivate your heart; the cut is perfectly polished to reflect the right amount of fire, brilliance and scintillation. Learn more about the unique diamond shapes and cuts at Shimansky.